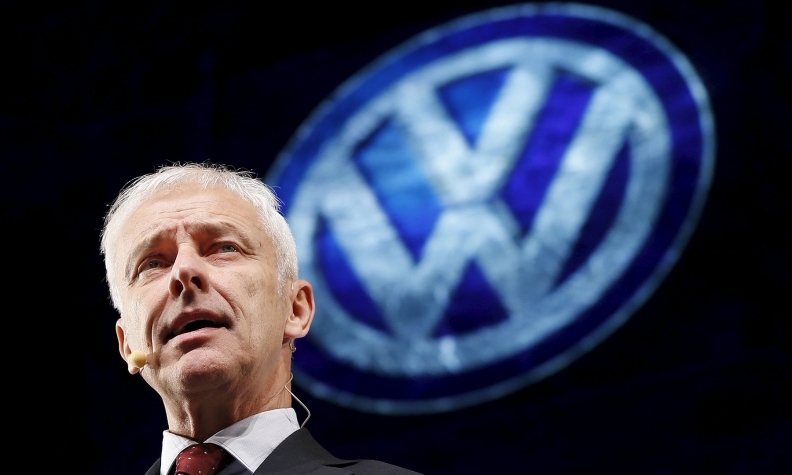 "We know that 2016 will be another highly demanding year for the VW Group," CEO Matthias Mueller said. WOLFSBURG -- Volkswagen Group has a chance to post solid growth in its operating business this year even as it grapples with its emissions-cheating scandal and a strategic repositioning, CEO Matthias Mueller said. Cost reductions at Europe's largest automaker are "in full swing" at individual brands and across the group, Mueller said at VW's earnings press conference on Thursday, reiterating a target for an operating margin of 5 percent to 6 percent, versus 6 percent last year, adjusted for special items. VW incurred an operating loss of 4.1 billion euros ($4.65 billion) last year, the biggest in its history, after setting aside 16.2 billion euros in provisions and slashing its dividend to help pay for the emissions-test cheating scandal. Costs of the manipulations and slumping demand in overseas markets led operating profit at VW's namesake brand to plunge 15 percent last year to 2.10 billion euros, causing the return on sales to fall to 2 percent from 2.5 percent, way below a 6 percent target. VW is ceasing unprofitable models, shrinking complexity in parts, streamlining model development and shedding hundreds of temporary jobs to accelerate cost savings at the VW brand. The steps have triggered a dispute with the powerful labor leaders who occupy about half the seats on VW's supervisory board. "We know that 2016 will be another highly demanding year for the VW Group," Mueller said, adding the company was making gradual progress in clearing up the emissions scandal. VW aims to increase its electric-car offering and is taking steps to boost online connectivity in its models as it struggles to reposition itself in the wake of the scandal. VW said it now expected long-term cost savings from its efforts to align truck brands MAN and Scania of as much as 1 billion euros a year, up from a previous target of 850 million euros. Efforts to improve structures and increase efficiencies across the 12-brand group will be fully in place by the start of 2017, and a business strategy spelling out targets and priorities through 2025, to be published in June, is making "good progress," Mueller said.